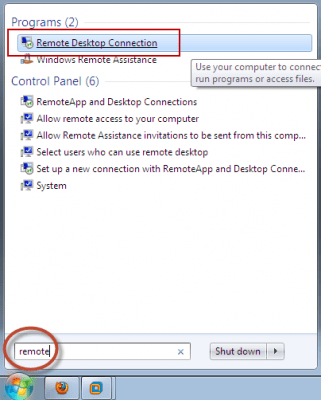 In order to allow other computers to connect remotely to your Windows computer, you need to enable the Remote Desktop Connection feature. 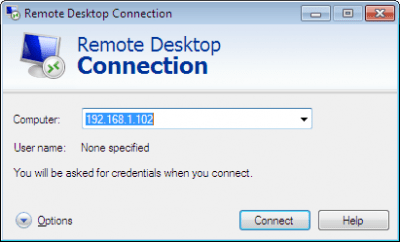 To learn how to enable Remote Desktop Connection check this tutorial. 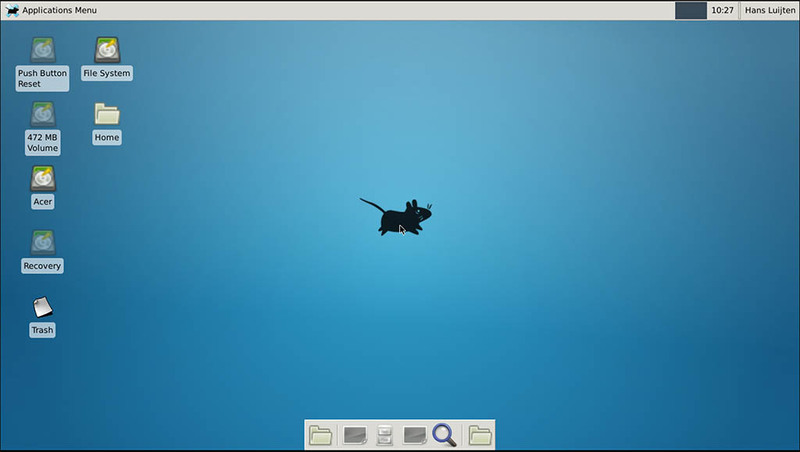 By default, Ubuntu doesn’t come with a remote desktop client which supports the Remote Desktop Protocol (RDP) used by Windows operating systems for remote connections. You need to install one of the clients available in the Ubuntu Software Center. 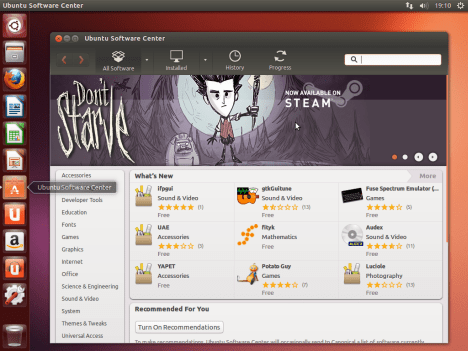 First, start the Ubuntu Software Center. Search for the words “remote desktop” and you will be shown all the available applications. We preferred to choose Remmina Remote Desktop Client, a client which is very appreciated by the user community and is, at the same time, very versatile and easy to use. To get it installed, select it and click Install. You are asked for your password. Type it and click Authenticate. NOTE: please keep in mind that, in order to install software, your user account needs to have administrative permissions. If you are set as a standard user account, you cannot install any software. Now the application is downloaded and installed. Wait until the procedure ends. 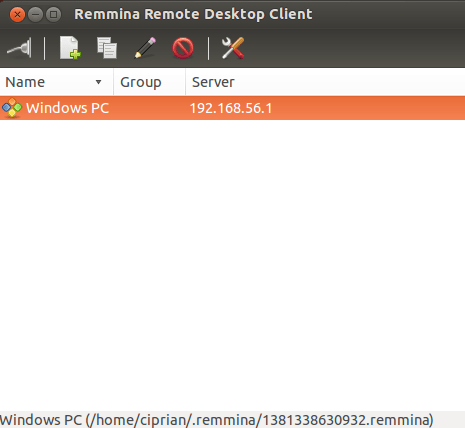 It is time to start the Remmina Remote Desktop Client. 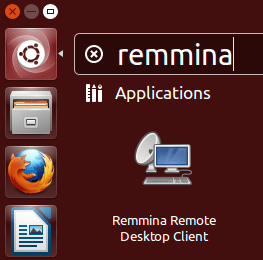 Search your Ubuntu PC using the word remmina and click on the appropriate search result. Click the “Create a new remote desktop file” button. The Remote Desktop Preference window is opened. Here you can configure the remote connection you want to establish. In the Profile section, type the name you want to use for the connection. It can be anything you wish. Then, in the Basic tab, complete the IP address of the Windows computer in the Server field. 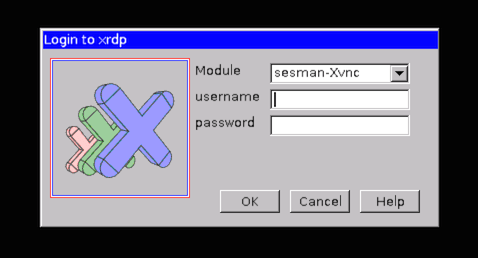 Then, type the username and password you want to use to connect to the Windows computer. Be aware that the user needs to exist on the Windows computer. If you are using a Microsoft account on your Windows 8 PC, it is OK to fill in your email address and password. You can also set the Resolution you want to use for the connection and the Color depth. NOTE: Selecting a larger desktop resolution and color depth can impact the performance of your remote desktop session. If you experience lag when connected to a remote desktop, try reducing the color depth or resolution. If you want to share a folder existing on your Ubuntu computer with the Windows computer, simply check the Share folder box and select the folder you want to share from Ubuntu. Also, for more advanced settings, go to the Advanced tab. There you can turn the sound on or off, share printers, disable clipboard synchronisation, etc. Once you are done making all the settings, click the Connect button. When connecting for the first time, a new certificate is created for the remote connection. Click OK to accept it. After a while, if the Windows computer is turned on and connected to the same network, you should be connected to it. 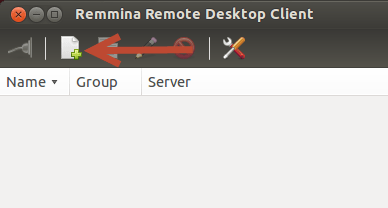 Once you close the remote connection, Remmina Remote Desktop Client automatically saves it so that you will be able to reconnect at a later time, with a simple click on the connection name. 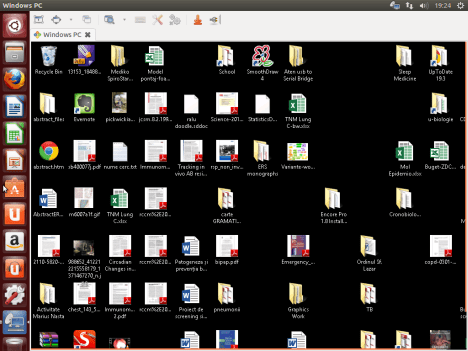 The second file we need to edit is the startup file for xRDP, so it will start xfce4. 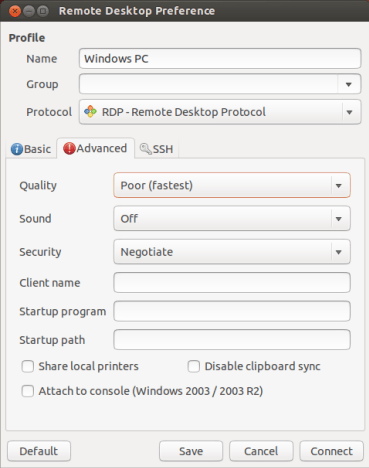 On the computer that will remotely control your Ubuntu machine, start you RDP client. Windows comes standard with a Remote Desktop client (mstsc.exe – you can start it from a command prompt, or find the shortcut to Remote Desktop under Accessories). Or Search ‘remote’ in start (Windows 7) Or ‘remote’ in search box in Windows 8. 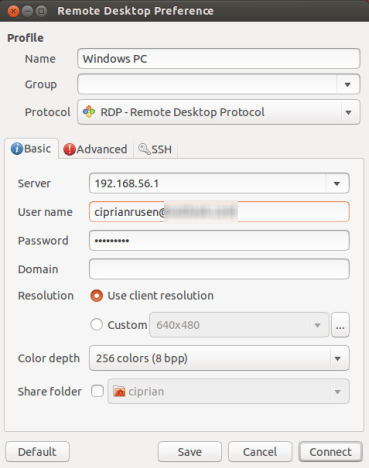 Whichever client you use, most work with either the computer network name or IP address of your Ubuntu machine. For remote system you’ll need your Ubuntu box at work to have it’s own, proper, internet IP address. Also, you need the externally visible address of ‘work’, AND have port forwarding set to direct incoming RDP requests to your work computer on the router. ← How to enable RDC (Remote Desktop Connection) in Windows 7/8/8.1/10.